This is Scott Hamilton in his early days as he was emerging onto the scene in the late Seventies when he recorded for a number of smaller companies before he was signed by Concord Records. Although at this stage in his musical career his style was not yet fully formed there was a hint of things to come. His tone was fairly light but as he progressed over the years it was take on a darker burnished hue but nevertheless the ideas flowed easily from his instrument. Warren Vache lived a little more dangerously and often finds himself in areas where his technique falls short but again this is early days and his ability on his horn improved, he becam a force to be reckoned with. The opening number “Thru for the Night” is more usually employed as a closing number by many other groups under a number of different titles. Scott slides into his solo and fluently explores the .merits of the tune. The rhythm section is as smooth as silk led by the ever dependable John Bunch at the piano, Michael Moore’s bass lines are rock solid and Butch Miles at the drums is supportive without being too obtrusive. “Imagination” gives us a hint of what a master of the ballad he was to become and it’s all rounded off by a beautiful understated piano solo from John Bunch. 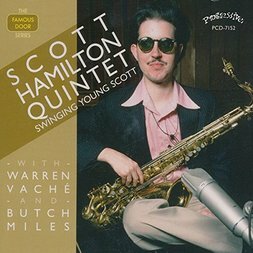 Scott is at his most hard swinging on “Warren Rush” and Warren Vache joins in the fun with a solo full of twists and turns. The easy paced “They Can’t Take That Away From Me” demonstrates that Scott can perform consistently at any tempo and Warren gives us his best solo of the album. The bonus alternative takes are not significantly different although Take 3 of “Scott’s Idea” is possibly more exciting than Take 1. These early recordings of Scott Hamilton can be accepted on their merits and does show what a committed player he is and even at this early stage what an interesting player he was. Recommended to all lovers of fine tenor playing and jazz in the mainstream without the need to be the next big thing.